America runs on Dunkin. Good till the last drop. The best part of waking up is Folgers in your cup. Sound familiar? 56% of Americans are coffee drinkers and consume an average of 3.1 cups a day. From age 18-64, the typical full-time employee will drink 47,840 cups of coffee. And that’s just coffee alone! We haven’t dug into caffeine consumption from soft drinks, energy drinks, tea, chocolate, or even medications. The Food and Drug Administration notes that 80 percent of adults in the United States consume caffeine in some form. It is the most used drug in our country. And of caffeine consumers, adults between 50 and 64 consume the most, which begs the question: how does this rapid consumption of this drug affect our health as we age? As we age we may become more sensitive to the effects that caffeine has on our body. Older adults may need to keep their consumption to earlier in the day. Seniors often have sleep disorders due to medications, dementia, depression, and anxiety. Cut off caffeine at least four hours before bed to ensure caffeine won’t contribute to any sleep interruptions. If you’ve ever over-caffeinated, you’ve likely felt the jittery, anxious, and mildly nauseous sensation that can come with it. The FDA’s recommended limit is 400 milligrams a day per person, which is about four cups of coffee. If your parent or spouse is an 8-cup a day kind of person, you may want to discuss cutting back on their intake. More than the recommended daily amount of caffeine can cause insomnia, fast heart rate, headaches or feelings of unhappiness, though there are many people who are unfazed by the effects of caffeine and can drink their green teas and coffees until late into the evening. Though many people contribute caffeinated beverages like coffee and tea with dehydration, caffeine is a diuretic. You may need to urinate more frequently, but it won’t dehydrate you. If your loved one relies on coffee to quench their thirst, try introducing them to water infused with berries, fruits and herbs as a flavorful and hydrating alternative. Caffeine also increases emission of the body’s main stress hormone, cortisol. Cortisol is most commonly known for driving the fight or flight instinct in stressful situations, increases heart rate, blood pressure, blood glucose, respiration and muscle tension. If your loved one is monitoring heart or blood pressure conditions, you may want to encourage them to cut back their caffeine intake. 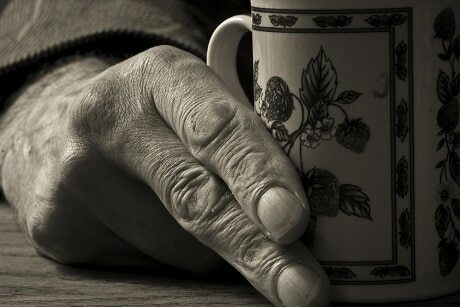 If you’re concerned about a loved one’s coffee or tea intake, consult with a physician. For all the potentially negative outcomes caffeine can have on your system, there are some benefits. Most people need a cup of coffee in the morning to “wake up.” Caffeine increases alertness in the brain, helps you pay better attention and reduces the feeling of being tired. Caffeine can increase strength. It’s popular among athletes as it improves muscle strength, improves training intensity and endurance. Consuming 200mg of caffeine increases your metabolic rate by 7% within three hours of consumption, so you burn more fat. It’s why you’ll find caffeine in weight loss supplements. The antioxidants in caffeine play a key role in fighting diseases like adult-onset diabetes, colon and liver cancers, Parkinson’s, and Alzheimer’s. Americans receive more antioxidants from coffee than any other nutrition source! At Aegis Living, there’s always a fresh cup of coffee or tea waiting for you in our bistro! We would loved to talk to you about the services we can offer your family. To learn more, stop by for a cup of coffee and meet our staff at an Aegis Living community near you.